“Elfs”, Cookies, Stockings, Cards, and a Holiday Meal! 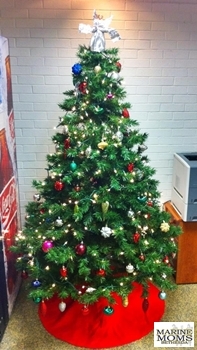 Here’s our AAR for Holiday Cheer 2010. Thank you to everyone who made it a wonderful success! You are SO appreciated!!! 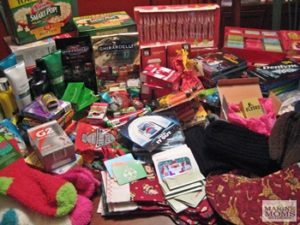 Some “Elfs” sent gift cards, some sent stocking stuffers and ornaments, and others sent checks to help with the Santa shopping. They also helped by getting the word out about “Holiday Cheer at Bethesda” by posting on Facebook or on their websites and blogs. Saying “Thank you” for your unconditional support of our wounded, injured, and ill service members seems inadequate to me. I have difficulty finding words strong enough to express the appreciation and gratitude that comes from the troops and their families when we gave them the stockings, cookies, cards, and food that they weren’t expecting. So many people have given their time, money, and hearts to help with our event and each one of you have touched many people in extraordinarily wonderful ways that we will never know. Thank you to the “Cookie Elfs” – Kate, Barb, Don, Robin, Janelle, Aunt Jeanne and Mr. Russell, Alice, Catherine, Chris and her ladies from Bayside Quilters – Barb C. Kris S., and Marlene, and Grace. Thanks also to Delmarva Blue Star Mothers for helping to fund the cookie tins. Jeanne, Janelle, Barb, Don. and Katie gathered together to sort the cookies into cheery tins. Each tin held a dozen assorted cookies. 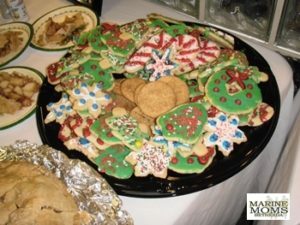 Just a few of the delicious cookies the Cookie “Elfs” made. Nope, they’re not mini-burgers. The cuties below were made by Alice and are vanilla wafers with a Peppermint Pattie between them to look like a hamburger, using red and yellow icing to hold them together to look like ketchup and mustard with sesame seeds on top. We filled 77 cookie containers with at least a dozen cookies in each, and have cookies in the freezer for another luncheon. Grace brought at least 8 more containers with her the day of the luncheon. 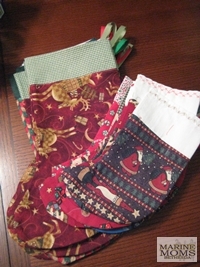 Stockings were stitched by Bayside Quilters and filled with the help of “Elfs” from all over the country. Thank you Bayside Quilters for your support and dedication to our troops not only for “Holiday Cheer’, but all year long. You have brought so many smiles and so much comfort to the combat troops and their families throughout the year. 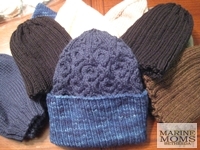 including hand-knitted hats by Jessi’s friends Cheryl, Tesia, Michelle, Abi, and “Covers & Soles”. Thank you! Thank you, Elf Jess, for heading this up! A HUGE project! And thank you for doing massages after you unpacked the stockings. Thanks also to “Elfs” Jason, Neale, and Erin who helped to wrap and stuff the 65 stockings. 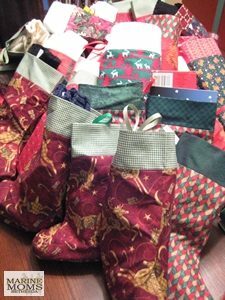 The stockings were divided between which ones were best for Mercy Hall and best for 5 East; some for the guys and gals we see every Mercy Hall luncheon (we know what they like); some had more “things” while others had more gift cards. 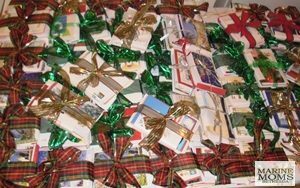 Cards were sent by people all across the United States from Alaska to Florida, Maine to California, Minnesota to Texas and points in between. Some just had a signature; some had every spare space filled with words. We made up 60 bundles with 30 to 40 cards in each packet. Thank you “Card Elfs”! Thank you, Janelle and Katie, for helping to screen them. Thank you to Susie, Grace, Katie, and Jess for the good food! 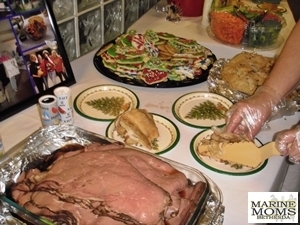 Menu: Roast beef, ham, scalloped potatoes, mashed potatoes, salad, rolls, appetizers, pumpkin pie, apple pie, cookies, and smoothies. I probably forgot something. 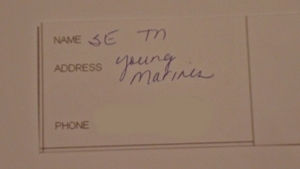 Hope is interning for her future Naval MOS and is required to do volunteer work as part of the requirements. She helped Susie and Grace serve the luncheon. 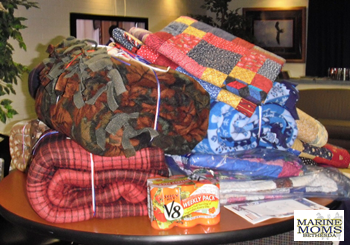 Bayside Quilters sent quilts as did some groups that are in contact with one of our volunteers. Melissa from Ohio sent some warm, snuggly, beautiful fleece blankets with cards from the families that made them. When we finished and packed up at Mercy Hall, Katie and I, with Hope’s help, went over to the hospital ward to distribute stockings, cookies, and the card bundles. When we returned to load up the car, the Mercy Hall staff was decorating with what we had left there. They ended up decorating two trees, one in the common room and one in the entryway. 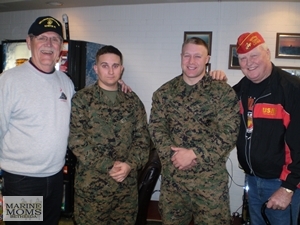 Our Choptank Marine Corps League friends were with us. They helped sponsor “Holiday Cheer”. 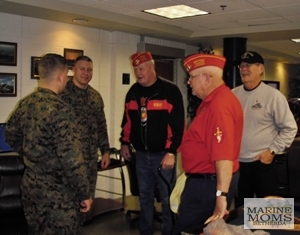 “A luncheon was served at Mercy Hall and gifts, blankets, quilts, canisters of cookies, stockings stuffed with goodies and packets of cards with greetings and thank you for your service were given out to the Marines recovering from wounds received in protecting our country. The meal was roast beef, and ham with all the trimmings. Later stockings, cards and cookies were taken to the wards where the non-ambulatory were recovering. Most moving was when a entire family of brothers and sisters, aunts and uncles, mother and father, grandfather and grandmother [just guessing at the relationship] came through the line and took their meal over to the ward to be with their son. They received gifts as well for him. We also thank and are grateful for our “Defenders of Freedom” for their dedication and commitment to our country. 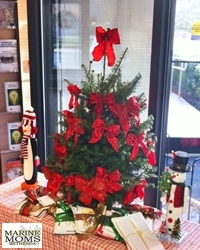 Wishing all of you a peaceful holiday season and ALL the Best in 2011. 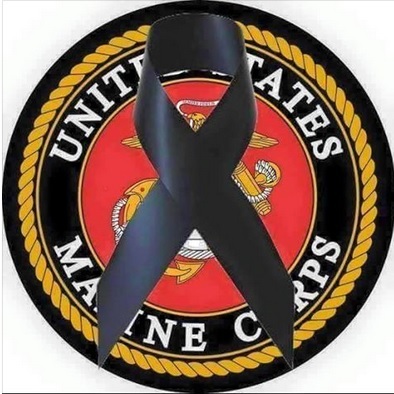 Until next time, continued prayers for our military and their families. 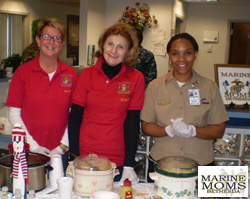 "Elfie" stuff"Holiday Cheer"Choptank Marine Corps League DetachmentMercy HallThank You!